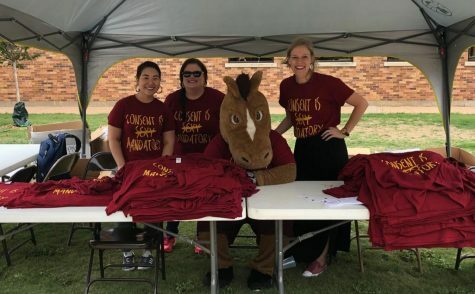 Maverick T. Mustang, mascot, and Counseling Center staff members gives out shirts for Consent Day at MSU #notonmycampusMSUTexas. Photo by Kristin Silva. On the Jesse Rogers Promenade outside of the Clark Student center, a tent staffed by people from the counseling center and Rachael Fornof, director and coordinator of Title IX, were handing out free shirts to those who could explain what consent means to them. Fornof said she wants students to get an understanding that this campus, this community is dedicated to a culture that supports and mandates consent in all situations. In asking someone to have their French fries at lunch, giving them a hug or engaging in sexual activity. The MSU counseling center were lending a voice to inform students about the meaning of consent. Along with Consent Day Fornof is planning staff and student information sessions on how to properly help peers and students in the case of sexual misconduct.